Notice how very close this wall is to an email Inbox, showing a sequence of conversations, most recent first. It would plainly be possible to represent an email Inbox in this fashion; indeed, any feed that might combine email, IM, SMS, photographs etc. can be represented as a wall. Although, as you FaceBook user, you can go look at the walls of others, and post there if you have authorization, most users spend most of their time posting on their own wall, and relying on FaceBook to relay the post to their friends’ walls. Thus most messages on FaceBook are available to all friends and do not need to be addressed. (*) Twitter represents an even more extreme example, where all messages are available to the whole world. There is no read/unread metaphor, unlike email, messages just scroll out as they age. There is no guarantee that a given message, posted by a friend to their wall, will show up on your wall – FaceBook automates the selection of which friends’ posts appear on your wall based on how many “wall interactions” (that is “conversations” in email terms) you have with the person. In other words FaceBook removes from the user (part of) the need to select the most relevant messages from the flood of possibly-relevant ones. Twitter addresses this somewhat differently, by tracking topics that are getting a lot of attention, and promoting them. It would of course be possible to combine the approaches, promoting both active topics and close friends. I think for consumers, FB has this figured out mostly. It has photo sharing, IM, simple status updates, simple messaging, some sort of functionality that allows for planning social visits, etc. It’s like internet for people who don’t want to have to use the internet. For the most part, I think this is right (leave aside the comment’s concluding rhetorical flourish about the Internet) – the “Social Wall” is an effective substitute for an Email Inbox. 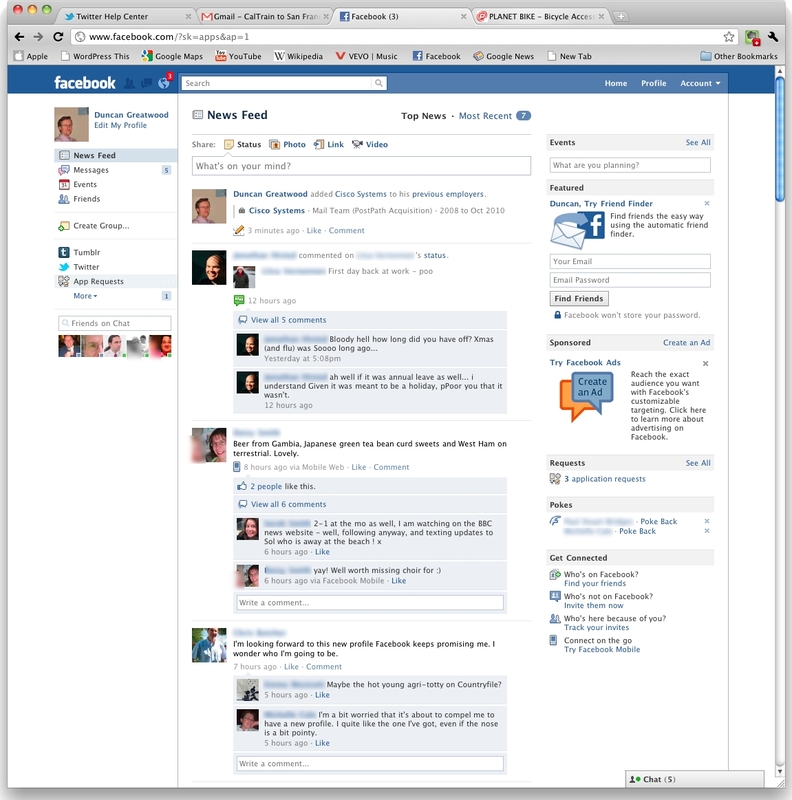 A social wall can even provide directed messages, and long-term searchability, albeit those things are not emphasized. It can cope with long messages by truncating them – indeed, it could deduce that a sender whose longer message is expanded by the reader deserves a higher relevance score than one whose longer message is not expanded. The presentation of an Inbox allows the display of a larger number of conversations – my Inbox is currently showing 31 conversations vs. 5 for my FaceBook page in the same screen area. This is partly a “bug” in Email – displaying so many conversations is a mechanism for allowing the user to sort them rapidly, which would be less critical if Email would help select what is of interest to me automatically – but it is also a feature, especially if reason #1 looms large and/or automatic relevance determination is difficult for a user. I would suggest that, but for reason #2 – universality – many users would be able to abandon email completely, at least in their personal lives. Yet, universality of email is likely to persist for a long time. Would there be value, then, in turning this around, and providing a wall-like and person-oriented experience for Email, that dramatically simplified the email experience for most users but retained, in some way, special features? The answer is almost certainly “Yes”, the benefits being: i) Turning email from a chore to a pleasure; and ii) Allowing you to connect to anyone via your favorite wall-based communication metaphor.